In tuberculous spondylitis the lumbar or lower thoracic spine is most often involved. 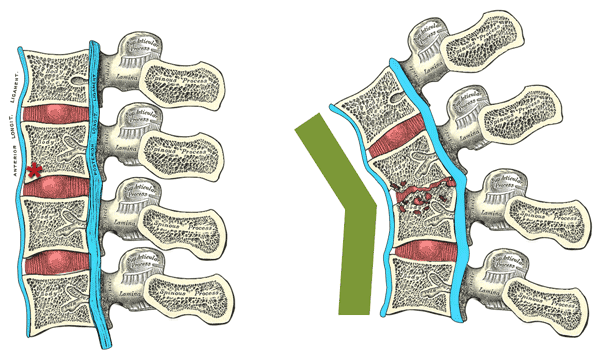 The disease usually begins in the anterior inferior vertebral body* and spreads beneath the anterior (or posterior) longitudinal ligament to involve adjacent vertebral bodies, and secondarily the intervening disc(s). Osteonecrosis and wedging of vertebral bodies causes a typical gibbus deformity. 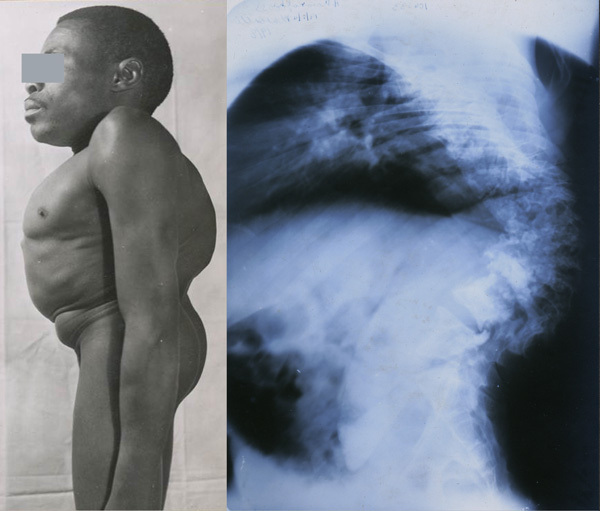 In South Africa, Pott’s disease is the commonest cause of kyphosis in adults. Sagittal section of four lumbar vertebrae and their ligaments. Mr HM, 32 years: In this case the disease is very advanced; complete destruction of a number of vertebrae has resulted in severe kyphosis ("hunchback") as well as scoliosis and loss of height. A common complication of tuberculous spondylitis is paravertebral, extradural or other soft tissue cold abscess. 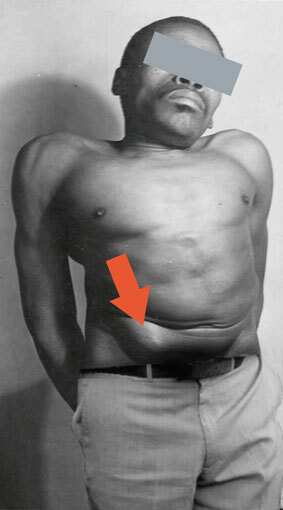 This can in turn result in a draining sinus in the lumbar triangle, groin or buttocks. In spinal tuberculosis there is seldom direct involvement of the cord but compression can cause neurologic deficit, typically Pott's paraplaegia.